A couple of years ago, two friends treated us to seats for The Oldest Boy at the Jungle Theater. 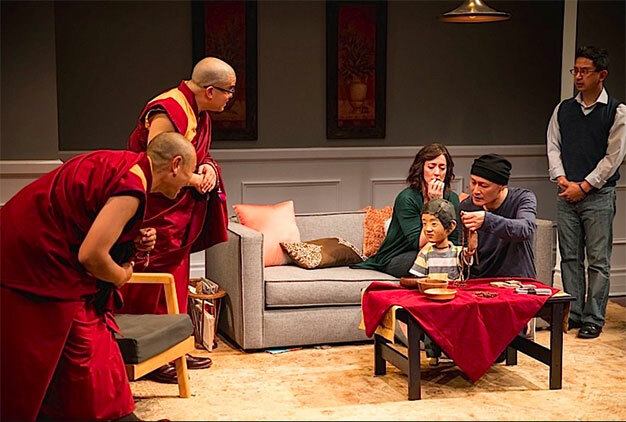 Written by Sara Ruhl and performed by a stellar cast, it’s a play about a woman whose three-year-old son is identified as the reincarnation of a revered Tibetan lama. The Lama and monk who come to visit and test the boy ask her to allow her son to be taken to their monastery in India to live. There are all manner of things to consider in this story. Faith. Motherhood. What if this happened to me? The various aspects of her decision are fascinating. But what kept me riveted to the story unfolding on the stage was the portrayal of the three-year-old by a puppet, a puppet who became so real to me that the end of the play was startling. Here I am, years later, still thinking about that play and the artistry of puppeteer Masanari Kawahara. If The Oldest Boy is staged near you, make every effort to experience it. I am grateful to our friends for sharing this deeply affecting play with us. Puppeteer Masanari Kawahara is at once visible and invisible in The Oldest Boy at the Jungle Theater. Unforgettable performance.